Okay, So Vertical Videos Are Now Art? Unperturbed by the scourge of vertical video shot on mobile phones, a bunch of Serious Artists have banded together for a film festival devoted exclusively to incorrectly oriented videos. Why subject our eyeballs to such unnatural composition? For art, duh. Vertical Cinema, made up of 10 specially commissioned works by experimental filmmakers, is a deliberate provocation. It's produced by the arts festival Sonic Arts, and it's playing in Amsterdam through this weekend. If you have an interest in craning your neck to watch algortihmically controlled pixels and abstract streams of light, then you know where to go. Here is Vertical Cinema's raison d'etre, in its creators own words. For the Vertical Cinema project we 'abandoned' traditional cinema formats, opting instead for cinematic experiments that are designed for projection in a tall, narrow space. It is not an invitation to leave cinemas—which have been radically transformed over the past decade according to the diktat of the commercial film market—but a provocation to expand the image onto a new axis. This project re-thinks the actual projection space and returns it to the filmmakers. It proposes a future for filmmaking rather than a pessimistic debate over the alleged death of film. Nowhere in the project's official literature are mobile phones mentioned, but it's hard not to be reminded of the only other scenario where we encounter such radically disorienting video: shaky phone footage on YouTube. Looking at the real world through vertical video is frustrating, like looking through blinders. People and things usually move left and right. The horizon is, well, horizontal. But the films in Vertical Cinema, from the video previews at least, aren't going for realism. The images it depicts are already abstracted, so the tilted axis seems no more bizarre than an artist choosing a canvas in portrait rather than landscape. 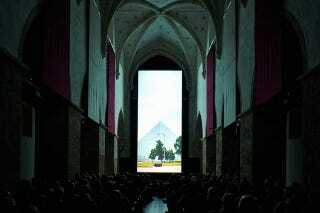 And these images of a tall screen at the end of a long cathedral-like space are undeniably striking, even gorgeous. I don't know if I'd actually want to spend a full 90 minutes craning my neck at these videos, but I'm at least a little bit intrigued by the possibilities. What is art supposed to do, anyway, other than give us a slightly different way of seeing our world?